The Seven of Cups symbolizes daydreaming, fantasizing, brainstorming, subjectivity, active imagination and exploring different possibilities. In its more negative expressions, it may represent indecision, illusion or empty imaginings which are impractical or never materialize into anything concrete. In the card we see a figure encountering all of his fantasies and desires, as well as the unconscious contents of his mind. He stares hypnotized by worldly riches, awards, spiritual mystery, adventure, love and wild fairy tale creatures. The shadowy figure is transfixed by the treasures which appear to him out of the clouds, poised as though ready to reach out but somewhat fearful or reluctant to do so at the same time. This may represent inability to make a final decision, or having a hunch but not acting on it. There are some situations which reward daydreaming, fantasizing and playful exploration within the mind. When we are brainstorming in a creative project, for instance, it is sometimes helpful to throw away all practical considerations for the time being and give the imagination the free rein to explore, experiment and fantasize. If we impose constrictions too early in a project, we may choke the life out of it and miss our chance for inspiration. At some point, however, one must pick a particular course of action, and then one must take steps to make it concrete reality. If we get lost in the dreamy haze of the imagination, either because we are incapable of making a final, concrete decision or because we refuse to adapt the ideal version of our vision to the practical limitations of reality, then all the great powers of the “inner eye” go to waste. Most often in a reading this card indicates the latter situation. You may be overwhelmed by an array of different options which you have to choose between, or hypnotized and fascinated by alluring promises which have no real basis. You may be operating under a delusion or illusion, or your plans may have no tangible relationship to the reality of your circumstances. Do not be fooled by “get rich quick” schemes or promises which seem too good to be true. You may be gullible or impressionable at this time. The Seven of Cups card is connected to Venus (Empress) in Scorpio (Death). The Seven of Cups card can represent daydreams, illusions, and fantasies in your life. You may be in a situation where you are faced with many choices in some aspect of your life, and need to rely on your vision to choose the best one for your life. Now is a good time to daydream rather than spend too much time rooted in reality. When the Seven of Cups card is reversed, it can indicate that your imagination may be blocked. Your daydreams might transform into thoughts of fear or anxiety, or you could be living in a downward spiral of depression, anxiety, or substance abuse. Now is a good time to stay as firmly grounded in reality as possible, and limit the time you spend in daydreams. The Seven of Cups card can represent illusions occurring in your work life. If a business deal come about that seems too good to be true, then it probably is and you may have trouble knowing who deserves your trust. If you work in a creative field, then now is a good time for growth and progress. However, if you work in a job that is more precise or mathematical, you may be spending too much time with your head in the clouds and need to refocus at work. The Seven of Cups card can represent the presence of many choices in your romantic life. If you are looking for love, you may need to think about the things that are important to you in relationships and carefully evaluate your potential romantic connections. You may feel swept away if you are beginning a new romance, but might need to evaluate soon if you are in love with that person, or if you just like the feeling of falling in love. 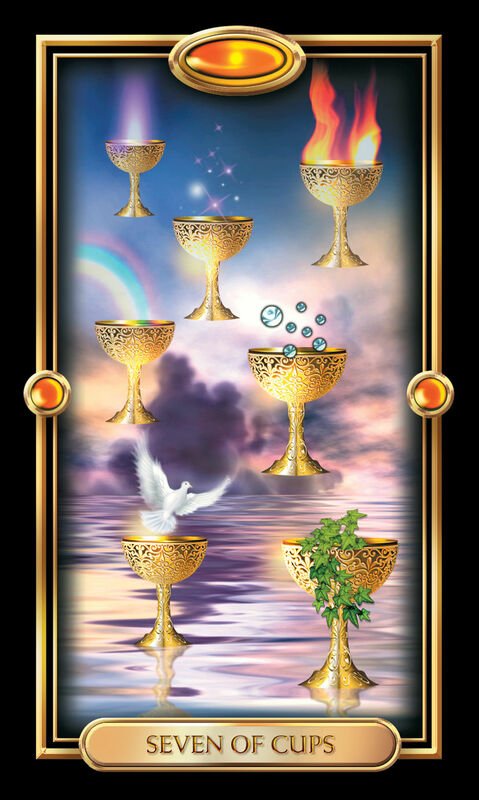 The Seven of Cups card can represent a period of caution in your financial life. Now is likely not a good time to make investments without consulting a professional or really researching the investment thoroughly first. If you own your own business, you may find yourself feeling scattered and will likely benefit financially through focusing on your efforts to your business. The Seven of Cups card can represent goals, desires, and positivity in your spiritual life. You might notice that you feel most positive and connected spiritually when you are visualizing your goals and desires being met, and will benefit most by surrounding yourself with positive affirmations and attitudes right now.